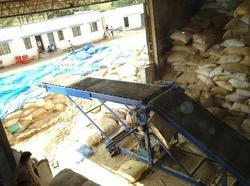 Bag Stacker Conveyors are suitable for stacking bags at various height, form floor to ceiling. The operators will off-load the bags from the trucks and place them on the conveyor to be conveyed to the top of the stack of bags, where another operator will off-load the conveyor and place the bags on the stack for storage. 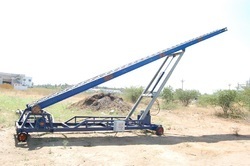 This type of conveyor is mainly used in stockpiling of warehouses. To match up the varying demands of the clients, we are engaged in offering extensive array of Movable Conveyor to our valuable customer. All our offered range of products has been made using the best technology. Our offered range of Movable Conveyor is excellent in quality and well tested on different quality parameters. They have been priced at very reasonable rates in the market and are available as per the demands of our customers. We have always given extra fine finishing to our final product range. Looking for Mobile Lorry Loader ?